i used synergy only a few times, some times as client another times as server. Today i change in my mac from client to server and it crashed. I reboot several times but it ever crash with no other message. i have reinstalled it. but still not working. Please post a screenshot of it. Please use v1.9 from Download Synergy 1.9.0 to fix the wifi macOS bug forums thread. Could you give me an older version like 1.7 to try? I tried 1.5 and it works. Please create a different thread and post your crash info there. OK, opened a new thread. i download the V1.9.0 and it still crash. @toran Our developers are now aware of this issue. They're currently working on crash handling to fix this. Please bear with us as we try to make Synergy better for everyone. We currently can't provide any ETAs but one thing I can assure you is that our developers are burning the midnight oil for this issue. Hi, is the problem already solved? I can't use this aplication. Hey @toran. Can you try to check what Joey did? 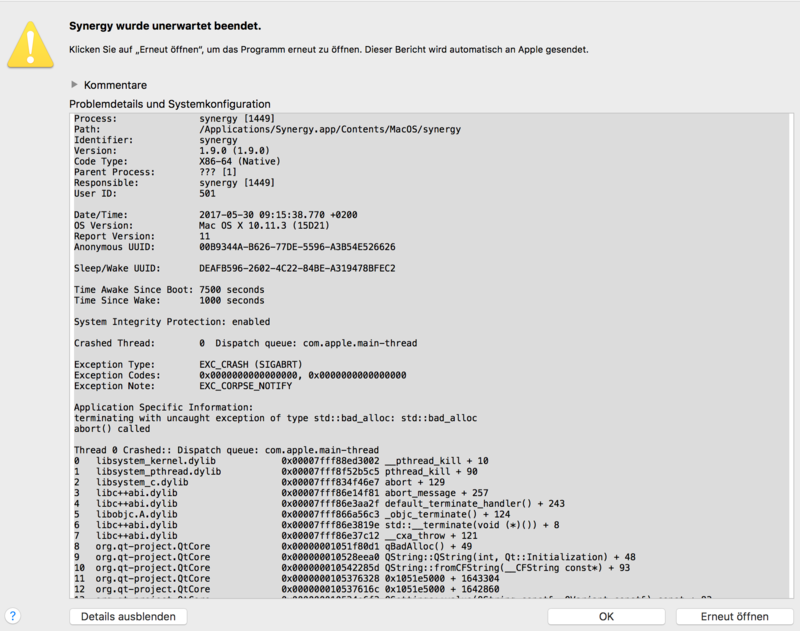 You can check Crash Upon Opening on MacBook forum thread.